Isn’t it ironic that funds raised yearly on tobacco control is below $400 million compared to $18 billion for AIDS, $2.5 billion for tuberculosis and around $2 billion for malaria. As a result, while there has been a gradual decrease in the incidence of AIDS, tuberculosis and malaria, tobacco-related deaths have been on a sharp increase. The WHO FCTC (Framework Convention on Tobacco Control) is a truce with an overall aim of protecting present and future generations from the devastating health, social, environmental and economic effect of tobacco consumption and exposure to tobacco smoke. It can also substantially reduce the prevalence of tobacco use and exposure to tobacco smoke. The domestication of the WHO FCTC by most developed countries has translated to marked reduction in tobacco consumption and less exposure to secondhand smoke in these countries. More than 8 million lives have been saved since the anti-smoking campaign started in 1964 in the U.S. Despite not adding the figures from other countries, we can say this is a huge number. We should also note that although the number of smokers recorded nationwide especially in Bangladesh, Russia, Indonesia and China rose to 1billion, this amount could have been doubled without the anti-smoking campaign. With reduction in the number of smokers in countries with stringent tobacco laws, its effect was the migration of tobacco companies to developing countries where such laws where neither existent or were poorly enforced as a likely result of ease in bribing and influencing the decisions of policy makers. 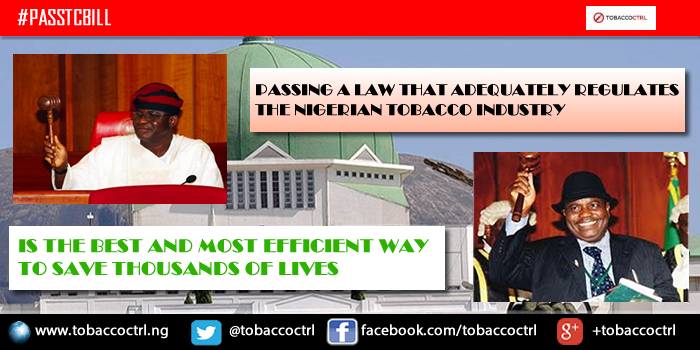 While many developed countries enjoy their freedom to breathe in non-tobacco tainted air in public places, it is distressing to know that the number of people who smoke in developing countries like Nigeria and other low and middle-income countries has increased over time. This trend has therefore led to an offset in the progress made in countries such as the U.S., Canada, Iceland and Mexico where smoking prevalence has decreased by nearly 50 percent. We also implore you to plan to attend public hearings that will be called by the National Assembly as part of the process of passing the bill and you can follow us on twitter, add your voice by visiting our facebook page, like our post, drop your comments and share the post widely with your family and friends.